Site plan for Glenmont MetroCenter, a now-aborted proposal to redevelop the Privacy World apartments in Glenmont. What to do with the Glenmont Shopping Center and its surroundings? That is one of the questions residents, business owners and those who frequent the Glenmont center will be asked to ponder at a community visioning workshop scheduled for Saturday, February 4 . . .
At the workshop, participants will break into small groups to discuss what they like about Glenmont, how Glenmont can better take advantage of its Red Line Metro station and other needs beyond the shopping center. Glenmont has a lot going for it: its very own Metro station; proximity to Wheaton, downtown Silver Spring and the nascent mini-city growing in White Flint; and stable neighborhoods supported by dedicated civic associations. But there are still serious challenges. The 1950's-era Glenmont Shopping Center is run-down, but its multiple property owners can't agree on any improvements. The county's onerous approval process forced one developer to cancel their plans to build in Glenmont, depriving the area of new investment. And as a response to the area's traffic congestion, the county Department of Transportation is building an overpass at Georgia Avenue and Randolph Road, which will only make it more difficult for pedestrians to walk to the Metro, undermining attempts to make Glenmont more of a town center. Meanwhile, WMATA is building a new parking garage right on Georgia Avenue, ignoring previous plans for the area along with the county's forest conservation requirements. Despite all of these problems, can Glenmont become the next great neighborhood in Montgomery County? Hopefully, this time we can get it right. If you're in the area, stop by the Planning Department's workshop. It's this Saturday, February 4 from 8:30am to 1pm at the Park Police headquarters (also known as the old Saddlebrook Elementary School) at 12751 Layhill Road in Glenmont. 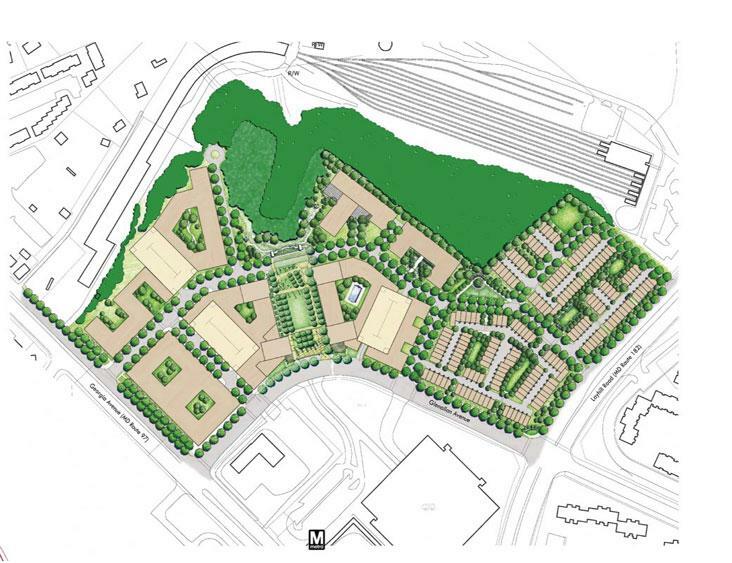 Not every neighborhood near a metro station is going to be turned into a "walkable community." As one end of the Red Line the Glenmont station's most important function is to be so accessible that people will park their cars there and ride the Metro (or BRT when it arrives) to work instead of driving. It seems a little odd that people are so concerned that small merchants will be driven out of Wheaton by redevelopment there but are ready to sacrifice a major shopping area in Glenmont. We have just thirteen Metro stations in Montgomery County, and not taking advantage of that would be a tremendous waste of time and resources. It's especially awful if people who already live within walking distance of Glenmont Metro can't safely walk there because of improvements meant to make drivers' lives easier. Even if Glenmont's parking garages are full, that station still has one of the lowest ridership levels of any station in the county and Metro as a whole, and the answer isn't just to bring more cars there. You can have a station that can serve park-and-ride traffic while doing other things. Silver Spring does just that - AND they're able to use Metro to attract housing, shops and businesses that provide tax revenues for the county. A lot of public funds will be spent on the parking garage and interchange in Glenmont, but it's unlikely that MoCo will see much of a return for it. That intersection is a nightmare. Just because you don't drive doesn't mean other people don't HAVE to drive. That intersection is dangerous for pedestrians and cars and is only contributing to global warming with cars waiting at that intersection for a half hour. BUILD THE OVER PASS! Glenmont will never be a downtown silver spring and a lot of what is in Glenmont SERVES the immediate community just fine. No one will want to move to Glenmont if the HORRIBLE OUTDATED traffic patterns remain as congested as they are. First and foremost: either reopen that Glenmont KFC or tear it down. The building in its current state is an eyesore! I was at the meeting and these are a few things I got from it. First, the grade separation of the Georgia Ave. and Randolph Rd. intersection will start in 2014 to be completed in 2016. Georgia Ave. will remain at grade level, and there will not be a highway interchange. Four lanes of Randolph Rd. will pass beneath it. There will continue to be a light on Georgia Ave. with pedestrian crosswalks and left turns between Georgia and Randolph. The Privacy World redevelopment is still in the works (though with a different developer). The traffic impact study will be completed Feb. 23 with a public hearing on March 5. My impression is that most of the attendees liked the idea of the additional retail it will bring. Also it was my impression that most of the attendees would like to see the Glenmont shopping center turned into a mixed use walkable village/town center with at least some increase in density. They want more and better retail/entertainment options and better pedestrian access to both Metro and retail. There is however no consensus on how much additional density should be included.